Angapradakshinam in tirumala procedure: Tirumala Tirupathi Devasthanam is one of the famous, oldest and richest temples in southern India and it will open throughout the year. Every day more than 50 to 100K pilgrims visit the Shri Venkateswara Temple for darshanam. Angapradakshinam importance & uses are mentioned below. Many sevas are available to the devotees for worshiping the Lord Venkateswara. Among all the seva’s which are been conducting Angapradakshinam seva is the seva which will conduct by the devotees. What is meant by Angapradakshinam Seva and How to perform it? Angapradakshinam seva is a form of worship offered by devotees to lord for his blessings. It is one of the oldest methods of worshiping the god. The devotees who want to make Angapradakshinam must take holy bath in koneru or Kolanu which is in front of the temple. For the devotees who want to make Angapradakshinam must have to take tickets. In this we provide you the information about how to get the Angapradakshinam seva tickets in Tirumala. The below is the procedure to get the tickets and other details regarding Angapradakshinam seva are as follows. 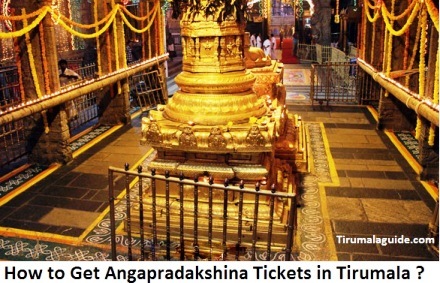 How to Get TTD Angapradakshinam Tickets In Tirumala? The devotees who are planning to make Angapradakshinam seva in Tirumala should remember that these tickets will not be available at online. These are available only at Tirumala C.R.O office. Angapradakshinam seva tickets will be issued for free of cost to the devotees. Only 700-800 tickets are issued. Pilgrims, who plan to do Angapradakshinam in tirumala temple, should stand in queue at C.R.O office counter. Then they will issue the tickets for next day, tickets will be issued using bio-metric finger print. These tickets are issued in tirumala temple on all days. At 1:00 am, the next day devotee had to report at supadam entrance after having bath with wet clothes. Devotees with wet clothes are only allowed to make anga pradakshinas. By 2:30 you will be inside the temple. You have to lie flat on the ground and make anga pradakshina in inner prakaram. Immediately after anga pradkshinam devotees are allowed for srivari darshanam. This is the good opportunity for the devotees as suprabatham seva will be running parallel. What is the AnAngapradakshinam Rules? Now Aadhaar card is mandatory for Tirumala TTD Angapradakshinam Darshan Tickets in Tirumala. Women should wear saree, duppata and salwar. Men with only dothies are allowed. Devotees who make anga pradakshina are allowed for Sri Vari darshanam on all the days except on Friday. On Friday TTD was not Issuing Angapradakshinam Tickets, no darshanam for devotees. Can i Get ttd Tirumala Angapradakshinam tickets online booking?